Trying to come up with an investment strategy that will hold up against myriad political and economic scenarios that are on the horizon in 2019 is challenging to say the least, but Finfeed does have an investment option worth considering. 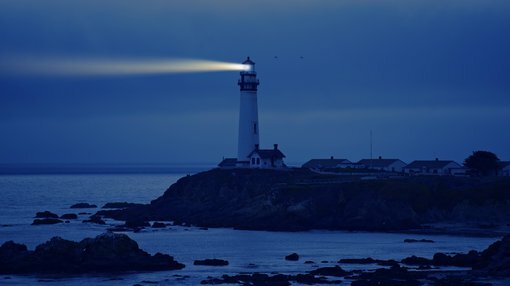 Firstly though, it is worth examining what lies ahead in 2019 for the world’s major economies, because an investment decision may be more about where to invest rather than what to invest in. As a snapshot, Brexit (May)hem, Mexit manoeuvring, a US/China trade rift/drift are all having a profound impact on equities markets. Even at home we have to put up with Scomo’s FOMO-driven policy on the run, while Shorten - the leader of the party most shorted in terms of achieving sound economic management - just waits for an election that he can’t possibly lose. In Australian Tennis Open promotional terms, it’s a real ‘which Nick will we get’ global scenario with none of the outcomes likely to be palatable. It is incredible that the majority of global uncertainty is stemming from the world’s largest countries by population and economic positioning. The economies of the US, China, all of the European Union countries and the UK are riddled with uncertainty. Trump is unpredictable on a minute to minute basis, and without having him as a Twitter friend, you don’t know what is happening in the US. Trump would do well to be guided by Eisenhower’s self-expectations, as he and his dysfunctional government are desperately in need of ‘wise resolutions’ to restore credibility and predictability. Likewise, the UK and the broader European Union require a Fixit rather than a Brexit. However, in stark reality the problems are too large and complex and the people that are charged with fixing them are more underdone than Nick was after his Australian Open basketball preparation. So having ruled out most of the world’s major economies, Finfeed has settled on South Korea as its best bet for 2019. This is a country that has embraced Western lifestyle while maintaining a disciplined work ethic that has been instrumental in driving strong productivity. From a political standpoint, the Constitution of the Republic of Korea has a liberal democratic system of governance that has allowed its economy to flourish while providing the stability and incentives for the development of a world-class manufacturing industry, as well as a highly ranked position in the IT sector with Samsung leading the way. 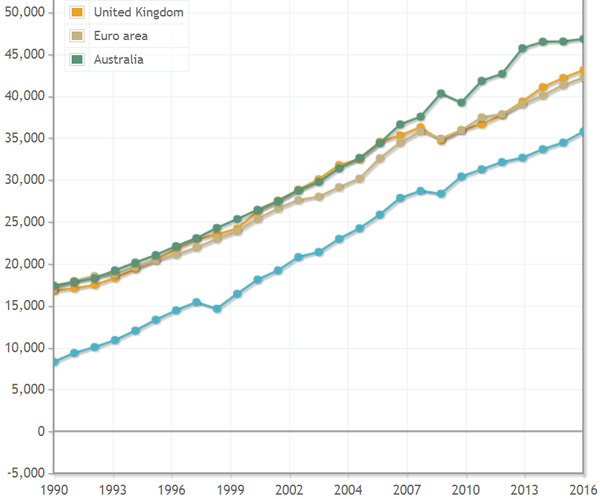 Examining historical per capita GDP (gross domestic product) is a useful way of comparing economic performance and trends over a period of time. This is based on purchasing power parity (PPP) where the PPP GDP is converted to international dollars using purchasing power parity rates. An international dollar has the same purchasing power over GDP as the US dollar has in the US. Consequently, this means examination strips out many of the variables that can result in misleading comparisons. The following chart with South Korea featured in blue demonstrates that it isn’t lagging too far behind large economies such as the UK and other countries in the euro region. South Korea isn't too far behind Western economies. While Australia put a sizeable gap between it and the other countries featured between 2010 and 2013, it tended to plateau post-2013. However, arguably the two most significant takeaways are the ground that South Korea made up between 1990 and 2016, and the speed of its recovery from the GFC compared with the UK and mainland Europe. South Korea’s PPP GDP only fell 1% between 2008 and 2009, and by 2010 it was 6% higher than the 2008 pre-GFC level. The chart shows that the UK and Europe took some time to recover to pre-GFC levels, and to highlight the resilience of the South Korean economy, the ‘Euro area’ took until 2014 to make the +6% mark relative to its 2008 PPP GDP. Examining more recent data, as at 1 January, 2018 the gap between South Korea and the UK had narrowed even further with the former experiencing rapid growth while the UK only made nominal ground in the last two years. In the comparison featuring 226 countries, the United Kingdom is ranked 40, just ahead of South Korea at 45. The manner in which the South Korean economy rebounded from the GFC, as well as its ability to grow GDP at levels many first world countries can’t match suggest that it could be a safe haven if we are in for a significant downturn in global equity markets. 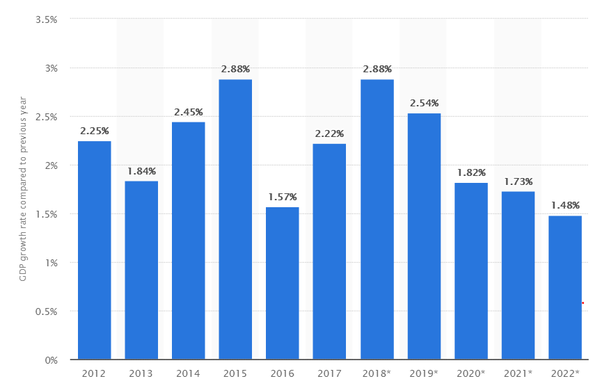 The following charts - the first being US GDP growth between 2012 and 2017 inclusive and forecast growth out to 2022 - highlight the past and forecast outperformance of South Korea (chart 2) compared with the world’s largest economy. 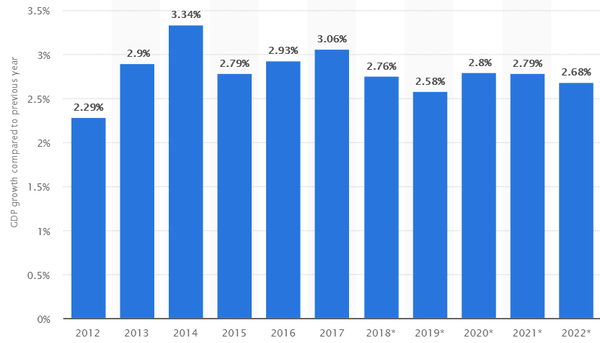 These charts show a substantial outperformance by South Korea over the US during the last five years, and based on forecasts out to 2022 its economy is expected to grow at a rate of approximately 2.7% per annum compared with 2.1% in the US. As indicated, this could provide some insulation against global volatility, and it is also worth noting that many of the country’s industries are focused on the manufacture of non-discretionary products, as well as devices that have a high turnover rate due to the regular release of new and improved models. This includes the likes of mobile phones, tablets, PCs, televisions and to some degree white goods. The country has little exposure to the mining sector, leaving it less prone to cyclical trends and significant fluctuations in commodity prices. Rather than jumping through the hoops to invest singularly in some of South Korea’s most prominent listed companies, Australian investors can gain exposure through the ASX listed iShares MSCI South Korea Capped ETF (ASX:IKO). 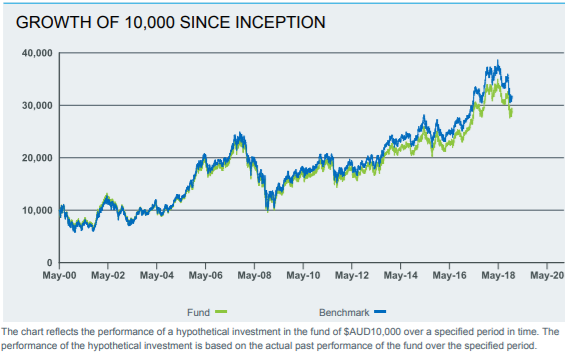 The following chart shows the growth of $10,000 since the fund’s inception in May 2000, featuring only one period of significant retracement, which coincided with the GFC. The fund delivered rapid growth of approximately 150% between 2004 and the commencement of the GFC. While there was a sharp GFC related retracement, the fund’s performance since then has been relatively uninterrupted until recent events. 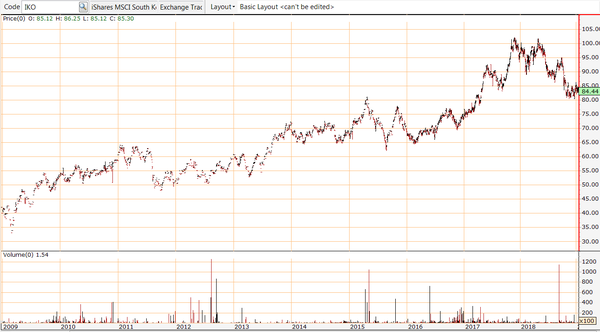 As indicated, an investment of $10,000 around the 2009 mark would have yielded a handsome return. An investment in IKO in 2009 would have yielded a handy return. The following chart shows the performance of IKO’s shares since the GFC, highlighting the outstanding growth and putting the recent retracement of about 15% since October into perspective. By comparison, the Korea Composite Index fell more than 20%, and between October and late December the Dow and the FTSE 100 both plunged by approximately 17%. Samsung Electronics Ltd accounted for about 22% of the fund’s interests as at November 30, 2018. However, after that there is some strong diversification, including leading motor vehicle manufacturer Hyundai Motor, global steel making group POSCO, prominent financial group Shinhan and Celltrion Inc., which provides exposure to the biopharmaceutical sector. IKO’s net asset valuation per share as at October 24, 2018 was $80.00. At that stage the Group’s shares were trading in the vicinity of $85.00, and a recent rally has seen them return to that level. What is worth considering though is the fact that a number of the fund’s key portfolio stocks have performed strongly in January, and it could be argued this hasn’t been factored into IKO’s share price. 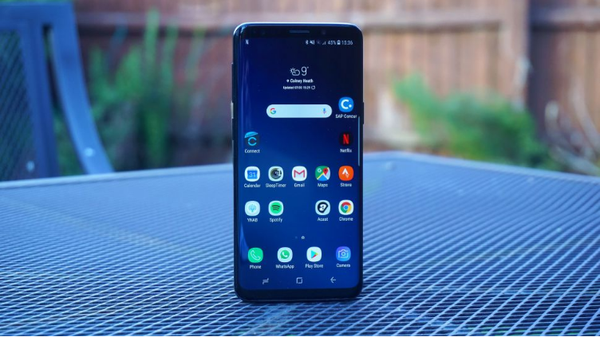 For example, Samsung Electronics has rallied more than 10% since January 4, and with the pending release of its Galaxy S10, a vote of confidence by consumers could see momentum continue. In the last 24 hours, techradar has released its first photo leak of the new phone. Samsung is set to launch its new phone.